Lakeville home builders may already know that according to research women are the primary decision makers for over 90% of new home and remodeling purchases. Knowing this fact, Lakeville Home Builders who incorporate this information into home or remodeling design and make decisions around this fact are able to capitalize on this information. Hallquist Design specializes in custom design and we stay current with trends. We feel that this provides the most successful new home or remodeling designs. Many of our Lakeville Home Builders have commented that bringing us into the project early creates excitement with the client and ultimately results in more closed sales. A systematic design process and detailed plans based on communication is what works best for our Home Builders in Lakeville. When budgeting for Professional House Plans in Lakeville it's important to understand how valuable they are success of your project. To build a new home on budget, on time and without disappointment in Lakeville it is imperative that you work with highly trained and experienced Professional Home Designers that will provide you with a well thought-out detailed house plan designed for your lifestyle, your lot and your budget. The time and investment required to develop a clear set of detailed house plans is far out weighed by the quality, efficiency and professionalism in which your project will be built. On the other hand if the house plan lacks detail and certain elements of design were never discussed, you may be disappointed because your home lacks character, you may have to pay twice as much to add certain design elements later, or you simply accept it knowing that it could have been better. Lakeville building officials need sufficient information from the Lakeville house plans to issue the permit. Contractors and suppliers will develop bids and pricing from the house plans therefore the more complete your Lakeville house plans are the more accurate and competitive the pricing is. Thorough up front planning will make for a less stressful building process, while saving you money and ensuring that in the end your home is everything you desired. 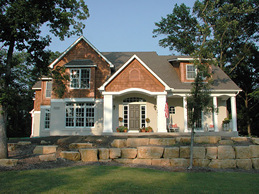 Please complete the form below to receive information on how we can assist your Lakeville, MN home design plan needs.